Introduction: Cost effective delivery of high quality medical care is a focus of today’s economic climate. An excess of 900,000 laparoscopic cholecystectomies (LC) are performed annually in both the inpatient and ambulatory setting. The material costs of laparoscopic versus open procedures have been extensively studied. A portion of these costs includes disposable instruments and trocars. We will analyze the potential cost savings in using reusable trocars (RT) vs. disposable trocars (DT). Methods: Reusable and disposable trocar costs at our institution were analyzed and compared. A cost analysis was performed including calculating a breakeven point amortizing the initial cost of the reusable trocars against savings and cost avoidance for disposable trocars. Potential savings were extrapolated using CDC National Hospital Discharge Survey data as well as National Survey of Ambulatory Surgery data. Results: The cost of reusable 10-mm and 5-mm trocars are $550 and $450, respectively (Versaport RT Trocar System, Covidien, Norwalk, CT). The cost of disposable 12-mm and 5-mm trocars are $70 and $45, respectively (Versaport Bladeless Trocar, Covidien, Norwalk, CT). We assumed a typical 4-trocar laparoscopic cholecystectomy. The initial cost of obtaining reusable ports is calculated at $2000. Subsequent trocar costs are effectively zero as sterilization costs are absorbed during the processing of the remaining instruments within the operative set. The cost of disposable trocars is $230 for each case. The calculated break-even point is 8.7 cases, demonstrating that cost savings accrue after the ninth case. A local and global analysis reveals that within our group of four surgeons, yearly savings can accrue to $46,000. 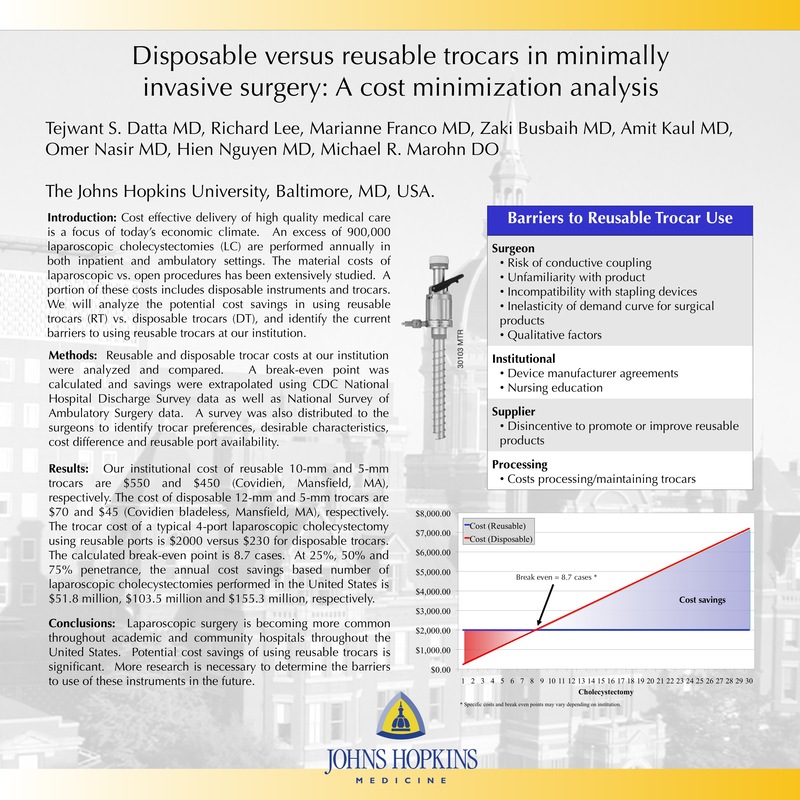 Assuming most of the surgeons nationally use disposable trocars, significant savings can be projected. Assuming 900,000 LC nationally, at 25%, 50% and 75% adoption of reusable trocars, the cost savings is $51.8 million, $103.5 million and $155.3 million, respectively. Conclusions: Laparoscopic surgery is common in academic and community hospitals throughout the United States. Potential cost savings of adopting reusable trocars is significant. More research is necessary to determine the barriers to use of these instruments in the future.